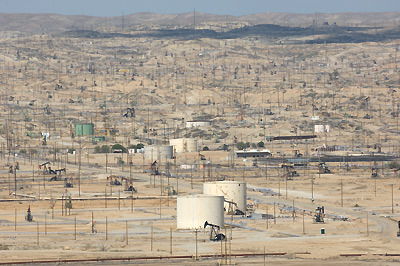 I've tried to get something like this shot of the Kern River oil fields near Oildale for a couple of decades now; this is probably as close as I'll get, taken early this afternoon on the bluffs overlooking the Kern with a huge long hand-held lens. One thing you learn over the years: taking shots of refineries, bridges, oil fields, etc., with a very big lens can cause all sorts of police activity directed towards you. Not this time, though (they were quelling a fight a bit further along Panorama Drive). 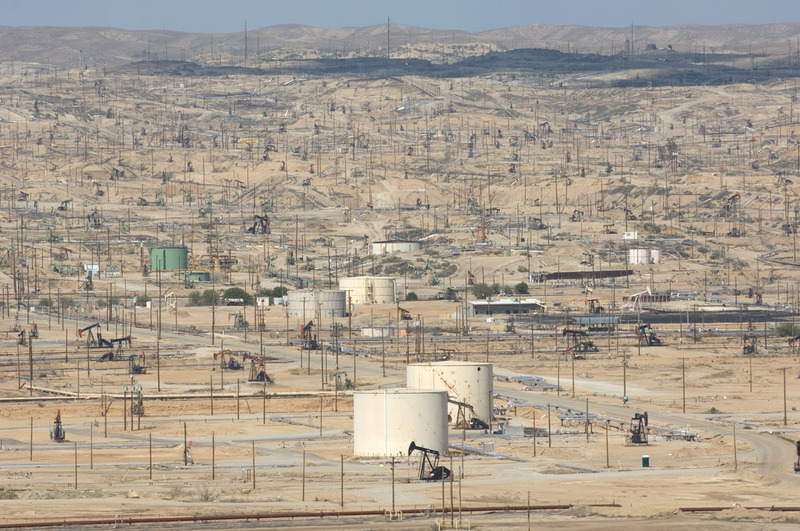 Click on the thumbnail above to get a bit of the flavour of the place (basically northeast Bakersfield): literally dozens of square miles of denuded desert hills crawling with wires, pipes, poles, fences, tracks, tanks, and swinging pumps. And it's constantly alive; all those nodding donkey pumpjacks plod along without moving, giving the whole scene a sort of organic Rube Goldberg / Heath Robinson feel.